Directly south of the Hamble lies the Isle of Wight and Cowes. Around the island’s coastline you can also explore Yarmouth, Newtown Creek and Bembridge. To the east of Hamble Point lie Portsmouth with its historic naval heritage, and Chichester Harbour. 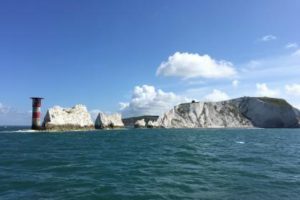 To the west you will discover the quiet waters of Beaulieu River, Lymington and Poole Harbour and further on, spectacular sailing in the West Country. A little further afield, the Channel Islands, Cherbourg and the Brittany coastline can also easily be explored. A unique event based marina with berthing for up to 260 boats offering all the facilities expected of a full service marina, situated on the northern shore of the Isle of Wight at the mouth of the River Medina. Upstream of Cowes Yacht Haven, on the starboard side, is Shepards Wharf, just minutes’ walk from the bustling centre of Cowes, with capacity for up to 100 visitors. East Cowes Marina is situated in a sheltered location on the Medina River, just upstream of Cowes town centre, with 140 visitor berths. There are supermarkets, a post office, a restaurant and café/takeaway outlets nearby in East Cowes town centre. West Cowes is also easily accessible by chain ferry or water taxi. Yarmouth is a picturesque fishing, ferry and yachting port at the Western end of the Isle of Wight with an old world aura. The quaint town is adjacent to the harbour and has a number of restaurants and pubs as well as a Yacht Club and a variety of small shops. The picturesque countryside of the West Wight is very close and is ideal for cycling and walking. Conveniently situated at the Western end of the Solent, access is available at all states of the tide. The Harbour is dredged to 2 metres below chart datum. Discounts for midweek overnight stays continue to be offered, £8 discount per night for vessels over 9 metres and £4 discount for vessels up to and including 9 metres. The harbour has been developed and the layout and navigation lights have changed. There are now more walk ashore pontoons with power and water. Bembridge is located on the east side of the Isle of Wight. A large natural, sheltered picturesque harbour whose entrance is restricted by the tides. The Harbour is adjacent to two attractive villages with good restaurants and spectacular walks. Situated on the southern edge of the New Forest between Southampton and Bournemouth and at the western end of the Solent, Lymington is a beautiful Georgian town surrounded by an area of outstanding natural beauty with the ancient woodlands and heathlands of the New Forest to the north. Very convenient for the town and its numerous restaurants, bars and shopping facilities, the 120 visitor moorings at Town Quay are available on a first come first served basis. In the Solent, almost opposite Cowes, the Beaulieu River and the 18th century shipbuilding village of Buckler’s Hard occupy a superb location surrounded by oak woodland within the Beaulieu Estate. Buckler’s Hard has been in the private ownership of the Montagu family since it was founded in 1724. It was here that wooden ships for the English Fleet were built and the village today retains much of the atmosphere of its shipbuilding origins. One of the most picturesque marinas on the south coast of England. Poole Harbour is one of the world’s largest natural harbours and the mudflats and salt marshes are of great ecological value for feeding and roosting birds. Poole is a large coastal town and seaport with award-winning beaches. A modern purpose-built haven within Poole Harbour, situated to the eastern end of Poole Town Quay with 125 serviced visitor pontoon berths. The Haven has easy access to many restaurants, cafes and bars in the town of Poole, with public transport just a short distance away. Weymouth Harbour is situated to the North East of Portland in the sheltered waters of Weymouth Bay, with golden sands, Georgian esplanade and a picturesque old harbour. Prevailing winds are South Westerly and the port can be entered at any state of the tide. A modern purpose-built marina providing over 280 permanent and visiting berths, situated in the inner harbour beyond the town’s historic lifting bridge. There are no tidal access restrictions. Commonly nicknamed Pompey, A significant naval port for centuries, Portsmouth is home to many famous ships, including Nelson’s flagship HMS Victory, and HMS Warrior and the Mary Rose. The Spinnaker Tower is a recent addition to the city’s skyline. Ideally situated as a base to explore the many places of interest in the area, with the historic dockyards just ten minutes away using the Gosport ferry. A unique atmosphere with a vibrant backdrop of Boardwalk restaurants, bars and shops, with top-class facilities. On-site six-screen Odeon cinema. Chichester has a number of places of interest, the most notable being the cathedral. Nestling in an enormous natural harbour, Chichester Marina has more than 1,000 berths, making it one of the largest marinas in the UK.